Let me take you to a very unusual place in Paris. Chances are that you’ve never stepped into it; in fact, you may not even be aware of its existence. I regularly walked by this location during my student years in the Latin Quarter but, preoccupied with school and bus schedules, I didn’t “look up” enough. Looking up should be a mandatory activity when one is in Paris as so many treasures are discovered above eye level. Of course, I was quite familiar with la Sorbonne, the famed university founded in 1257: during those innocent, pre-terrorism times you could wander around the campus without producing a school ID and having your bag searched. If you want to visit the Sorbonne nowadays and check out the 162 chapel or the opulent Grand escalier, you will need to book a tour. 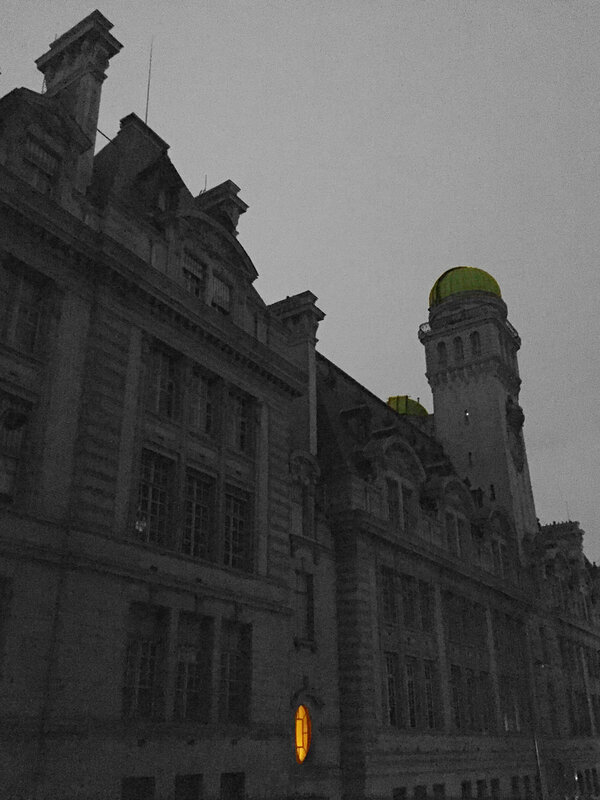 And if you walked along rue St Jacques and looked up, perhaps you noticed two vert-de-gris cupolas: the Astronomy Tower. But if you schedule a visit of the university, be aware that it will not include the Astronomy Tower as it is rented to and administered by the Société Astronomique de France. Securing a reservation to the Observatoire de la Sorbonne is akin to a Herculean task: visits take place only on Monday and Friday evenings and the size of the group is limited to five people. Five! In addition, reservations must be made by phone (about two months in advance) and purchased by check, in euros. Tours are led by volunteers of the SAF: they are passionate about astronomy, quite informative, and well-versed in the history of the university. Although la Sorbonne no longer teaches astronomy, members of the SAF use the facility to build their own telescopes. It took a full year and three attempts before I could score a couple of tickets timed with one of my trips to the capital. Persistence paid off: exactly one year ago, we arrived at 17 rue de la Sorbonne to meet our guide Patrick and three other lucky guests. After a security guard opened a large wood and iron door to let us in, Patrick introduced himself and led us to the Cour d’honneur. Flanked by the chapel at the south end, the cobblestone square represents the footprint of the university as Richelieu had it renovated around 1635. He was the proviseur in 1622 and continued to spearhead the work until his death in 1642. He is buried in the chapel. We make our way across the courtyard, toward the columns in the northeast corner. The area looks empty save for a couple of lingering students who are sitting under the arcades. Light shines through a few windows but the vast Renaissance-style building feels eerily mysterious. Once inside, we meander through a few galleries and I furtively glance at the Richelieu amphitheater with its wooden benches and monumental painting: the door is open, it’s tempting to enter, sit in, and pretend I’m a student again. We take an elevator, then a narrow escalier en colimaçon that finally leads to a very small, cluttered room: clearly, a group larger than six persons would be very cramped. It is the workshop where SAF enthusiasts grind and polish the mirrors they will use in their home-made telescopes. A lengthy task: it takes about 100 hours of methodical work before the glass blank is smooth enough to be coated with aluminum. If you are curious about the process this link explains it all. The room is filled with thick slices of plaster covered with small ceramic tiles to grind the glass blanks, various powders of different grain size used as abrasives, and pots of pitch to smooth the mirrors. More stairs to get to the top! We leave the workshop and climb an even narrower wooden staircase that takes us to the pièce de résistance of our visit: the upper cupola. The lower cupola, Saint-Sulpice, and the Eiffel Tower. It’s pitch dark except for the exit sign and our eyes need to acclimate. Very slowly, and with the help of Patrick’s flashlight, a room worthy of Jules Verne novel emerges: a 130-year-old telescope positioned in the middle of a wood clad dome that looks like the inside of a giant basket. The main event: a 130 year-old telescope. A creaky staircase leads to the antique instrument. Heavy noisy chains and pulleys allow us to open the cimier. The cupola itself is on rails and can rotate 360º, allowing the telescope to point toward any direction of the heavens. It’s a scene right out of a steampunk movie promising history, science, and adventure. Pulley, chains, and elbow grease are needed to open the dome. Note the steeple of St Germain des Prés framed by one “eye” of the pulley! Not promised: clear skies. Instead, it has been an overcast day in Paris and the cloud cover will not allow us to see any star tonight. Patrick points the telescope toward les Invalides and the Eiffel Tower; he makes the necessary adjustments and invites us to climb a few stairs and take a look. Minutes earlier I had watched the sparkling light show that la Dame de Fer puts out on the hour; now I could observe the lacy details of a steel beam bathed in bright white light. I place my iPhone camera against the eyepiece, press the shutter, and hope for the best. We pull on the chain again and the cupola door slides and groans. The loud metallic noises abruptly stop: the tomb is sealed and dark again. We carefully walk down the stairs to pick up our bags in the workshop below. I take one last look at the Panthéon nearby and the Paris skyline at night: the panorama is simply superb. The Panthéon, tour Clovis (at Lycée Henri IV) and St-Etienne-du-Mont. But the visit is over and we make our way back to the courtyard. I stay behind the group wanting to soak in an extra minute of this enveloping experience, this secret visit. One last look at the chapel: Patrick and the guard are waiting for me to exit so they can lock up. It’s 10:30 pm and I hear the heavy door close behind me. Out on the street, my eyes look up and I finally see stars: the kind produced by lamp posts and neon signs. I confess that I felt some anxiety about flying with our dog as we were relocating to France. Lily was never much of a traveler: for starter, she would routinely get car sick after a twenty-minute ride. Our ace in the hole was that she was used to sleeping in her crate and had no issue with being confined overnight. Her small size gave us the option of flying her in the cabin with us but I was still concerned about her spending some twelve hours enclosed in her carrier. All pets have different personalities but I thought I would share our experience about Lily’s Excellent Adventure and about her new life in France: other humans might glean some insight to make their four-legged companion’s travel less stressful. Are we there yet? My uncles Rick and Jim gave us a ride to the airport in their motorhome. Loved it! 1/ First things first: not all airlines accept pets in cabin (or in cargo, for that matter) so check airline websites for their pet travel policies. Those that do allow pets in cabins limit the number of animals on a given flight. Except for service or emotional support animals, your pet will be confined in his carrier for the duration for the flight, and the carrier must fit under the seat in front of you (that pretty much nixes flying Business Class outfitted with a lie-flat seat.) And yes, the carrier counts toward your luggage allowance. Find out the maximum dimensions of the allowable carrier and train your pet to spend time in it. In our case, we switched Lily from her “spacious” hard crate to the much smaller soft carrier four months before departure, hiding treats inside to motivate her to explore her new digs and feel more at home. Oooh! Lots of new scents at the farm! 2/ Book your flight several months ahead with an airline rep. Websites will not tell you whether the “animal quota” for a given flight has been reached. I wanted to use United Airlines miles for our flight. I checked online for award availability around our desired departure date; then I called their reservation center to inquire about having a pet in cabin on my preferred itinerary and confirmed that we could bring Lily with us; I booked our flights and asked the rep to add Lily to my reservation ($125 extra.) I printed my ticket receipt and made sure the “pet in cabin” was listed on it. A mole hill! First, dispatch the dirt; then, sink the nose into the hole. 3/ Several health documents need to be filled and verified before your pet can fly with you and the requirement vary with origin and destination. 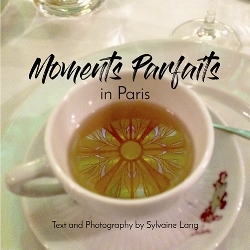 Stacie, a Facebook friend who regularly flies to France with her compagnon à quatre pattes, shared many helpful pointers. Do not assume that your veterinarian is well-versed on that topic: do your own research on the government pages of the country you will be visiting. Regulations and forms are complex. I strongly encourage you to visit the Pet Travel Store and to order the appropriate forms from them: they will be tailored to your destination and pet species. I just know there is a mouse hiding between these logs. 4/ Make sure that your vet is accredited by the USDA: our regular vet was on maternity leave and her substitute was not USDA accredited: we had to make an appointment at another veterinary clinic. Your pet must be implanted with an ISO 15-digit non-encrypted microchip. EU authorities will not be able to read other styles of microchips: you’ll either need to have the “correct” microchip inserted by your vet or rent/purchase your own microchip reader. A microchip certificate must be filled by the vet. Your pet must be vaccinated for rabies at least 21 days prior to entry and the vet must fill out the EU Veterinary Certificate from France (7 pages) not more than 12 days prior to your travel date. IN BLUE INK (I don’t know why but I’ve learned to never question bureaucracy…) Then, the certificate must be taken (or mailed) to your USDA/APHIS/US Area Office, along with a check for $38, for certification; use Express Mail both ways as you will need the certification to fly out. You also must complete a Declaration of Non-Commercial Movement. Additionally, most airlines require a Veterinary Certificate for Domestic and International Airline Travel where you vet states that your pet is healthy enough to travel, is free of parasites, shows no evidence of diseases communicable to humans, and has a valid vaccination against rabies. I’ll just watch my territory from the front door. And work on my tan. 5/ All these forms constitute the “Pet Passport” and must be presented when you check in for your flight. It’s a good idea to have a set of copies with you as some airlines will want to retain the information and check-in counters do not usually have a copy machine nearby. The originals stay with you for entry into France. My new cousins are cool. Aunt Françoise also keeps two cats and one hen. I’m not too fond of them; I like to chase them but that big chicken is a bit scary. To make sure that Lily met all requirements, I booked our flights four months in advance, ordered the forms from PetpassportStore.com, contacted my vet to make sure the microchip was the 15-digit style, scheduled an appointment 10 days prior to our departure (we spent two solid hours at the vet’s office: they’re just not familiar with the forms and requirements) and sent Rick to the USDA office in Sacramento the same day. Just to be on the safe side, I asked our vet to prescribe some Cerenia, an anti-nausea drug, that we gave her before the car and plane travels. We also had a mild sedative on hand in case she got too agitated in the plane but we didn’t use it. Where is this delicious French food I keep hearing about? After a nice Sunday lunch, I got to nap in the hammock with Cousin Brice. Documents were thoroughly reviewed by the airline rep when we checked in but les douaniers didn’t bat an eye when we arrived in Paris. We were pleasantly surprised by Lily’s demeanor throughout the trip in spite of a flight delay of three and half hour: she made friends with several passengers at the gate who turned out to be seated in the row in front of us. Kudos to the crew on our United Airlines flight: they encouraged us to get her out of her carrier and to hold her on our laps for takeoff and landing. They also offered to give her some water. Well, I didn’t want to tempt fate and watched her water intake like a hawk but Lily is blessed to have a bladder of steel! The long car ride went smoothly as well. I was a proud mama. Mom says I still need to work on my table manners. IMPORTANT. The informations supplied above applied to our specific situation: flying from the US to France with one dog in July 2018. Requirements can vary depending on several factors such as pet species, number of animals traveling, country of origin, destination, stopovers, etc. Three years ago, after checking out the latest trends at the Colette concept store in the 1st arrondissement, I walked toward Palais Royal and found myself in front of église Saint Roch. Throngs of teenagers were sitting on the steps, enjoying a sunny day while chatting and eating Japanese fast food. I turned into rue Saint Roch and couldn’t miss the smallest antique shop in Paris. I had heard of Rarissime but never visited before. It seemed to be carved inside the church. Rarissime. A rare find indeed. It was closed for lunch. So, I walked to rue Ste-Anne, devoured a very satisfying yuzu éclair at Aki Boulanger and returned to Rarissime a while later. Antique decanters and, perhaps, a Quimper bowl. As I walked in I couldn’t believe how tiny this place was: the depth of the shop from the façade couldn’t be more than ten feet. Apparently, it used to be a place where people would buy religious trinkets. Roger rented the space from the city of Paris and agreed to renovate the shop. He even built an impressive stone spiral staircase: the steps above the second level served as display areas for Roger’s finds. He told me that he shopped at vide-greniers and estate sales; he stored his treasures at his home outside of Paris. Roger’s selection looked eclectic enough until a gentleman stopped by to pick up a carton of six eggs. Roger said he brought them from his village every week and he had many regular customers. Old objects and fresh eggs: an unusual combination to be sure. I perused a whole folder of vintage photographs and told Roger I would visit him again on a future trip. When I returned eighteen months later, the shop was fermée and the windows were empty. I inquired about Roger at the hotel across the street and was told by the receptionist that he had finally retired to his village. It made me happy, and sad at the same time. Empty windows. Where is Roger? Last September, I headed out to église Saint Roch again: I just had to find out whether the teeny, tiny store had welcomed a new tenant and it had. It’s now the home of Brigitte Tanaka, a collaboration between a French and a Japanese designer. Brigitte Tanaka: French and Japanese, old and contemporary. It was closed for lunch. So, we walked to rue Ste-Anne. I’ll miss Roger.